Tea has been central to several cultures around the world for centuries, but in some traditions, its role is not limited to that of a beverage – tea leaves act as a portal to help humans grapple with the most fundamental questions that have plagued humankind from the beginning of time – the mysteries of the unknown. It offers insight and comfort in times of uncertainty, and the practice of reading tea leaves still thrives in many parts of the world. Reading of tea leaves is an ancient tradition that is also called Tasseography or Tasseomancy. ‘Tasse’ comes from the French word for cup, and the Greek root ‘mancy’ which means divination. Tasseography is also used to describe the art of reading coffee grounds and wine sediments, but without a doubt, tea-leaf reading is the most popular type of Tasseomancy. The true origins of Tasseomancy are uncertain. But we do know for sure that tea-leaf reading, as we know it today, originated in Europe, and was popular in Wales, Scotland, Ireland and England. But, it is likely that versions of Tasseomancy were also part of the culture in the Middle East. However, in these regions, coffee grounds were more likely to be used to practice this art, instead of tea leaves. Tea travelled to the Western world from China with Portuguese missionaries in the 16th century. But it was the Dutch who, at the end of the 16th century, started importing tea from China and popularising it. From here, the habit of drinking tea spread throughout the rest of Europe. But, until the 17th century, tea was strictly an aristocratic drink. 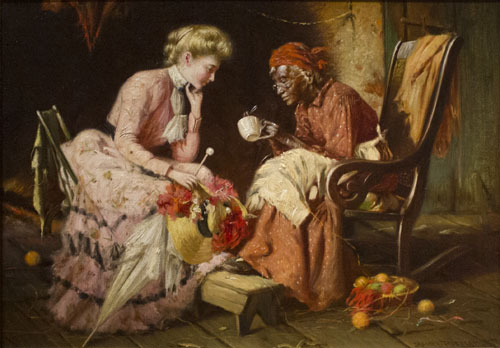 All this changed in the Victorian era when tea-drinking was adopted as a beloved habit by all classes. It was in this era that Tasseomancy came into existence. But its rise cannot be looked at in isolation: the lower and middle classes already had a propensity for fortune-telling and the occult. Previously, these practices involved deciphering symbols from molten wax and metal. Compared to these, Tasseomancy was a safer alternative. It also had an added benefit that the other forms of occult didn’t it gained popularity with the aristocracy. It was seen as a way to reflect on the self, and to know oneself better – an exercise in psychology rather than psychism. This was, in part, fueled by the popularity of Sigmund Freud and his groundbreaking work on psychoanalysis. Tea time gatherings were already a ritual in this period, and after a round of tea, patterns in cups were analysed and discussed. In these situations, however, there was no oracle interpreting the symbols– the drinker analysed his or her teacup for himself. This is, of course, where the psychological aspect came in – the symbols and the meanings attached to them were personal, offering insight into their psyche. Tea Leaves, 1909. 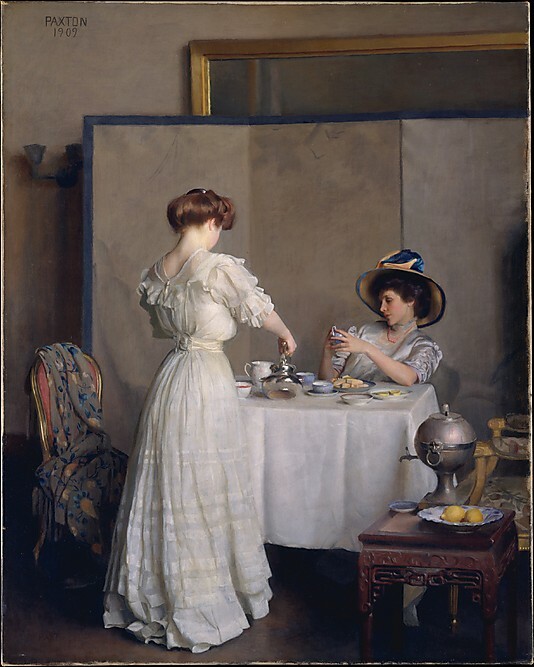 William McGregor Paxton (1869-1941). Metropolitan Museum of Art. The tradition of casually reading one’s own tea-leaves at social gatherings fell away when the Romani or gipsies began to be associated with Tasseomancy instead. But its popularity did not dwindle — the Romani were invited to the social gatherings, especially when tea parlours came into existence, and gave guests a glimpse into their futures. It was also at this time that specialty cups were created, singularly for the purpose of tea-leaf reading. These would feature the signs of the zodiac or even the symbols that are most commonly associated with Tasseomancy, like spades, mountains, and houses. Establishing it firmly as a serious form of divination is the seminal text called A Highland Seer that was published in 1881. This book has standardised most of the symbols that are now recognised in Tasseomancy. The true test for Tasseomancy came about when the teabag was invented at the turn of the 20th century. Although there was a brief dip in the tradition, it picked up again, in the following decades, especially during the World Wars, when it was a means of income for women, who would hold sessions in tea parlours. More than a century later, Tasseomancy is still very much a thriving branch of the occult. The internet is flooded with articles on how to learn the basics of deciphering your fate after you’ve finished your morning cup. It also makes appearances in pop culture through books and movies. The most famous of these, of course, is JK Rowling’s Harry Potter series. In the books, the art of Tasseomancy is part of the Divination course that is offered in Hogwarts, the wizarding school. It is treated with a certain amount of scepticism and provides a moment of comic relief when Harry is asked to interpret the symbols he sees in his friend’s teacup — “A load of soggy brown stuff,” he says. The popular TV series, The Marvelous Mrs Maisel, also features a memorable scene with a tea leaf reader. In a moment of vulnerability and despair, it is the ‘throwing of the cups’ as Tasseomancy is referred to sometimes, that offers comfort. There are a couple of things that are important when trying your hand at Tasseography. For one, the colour of the interior of the cup is critical. A dark coloured cup makes it harder to see the intricate patterns that are being formed by the tea leaves. To help read the leaves better, it is also recommended that the cup be shallow (so put away your coffee mug! ), with sloping sides and a wide mouth. Just as important as the cup, are the leaves that are used to brew the tea. It goes without saying that Tasseomancy does not work if you’re using tea bags – loose tea leaves are a must. In general, finer leaves are easier to decipher than larger ones. However, there are no rules on where the tea must be brewed – it can be made in the teapot or directly in a cup. Once the tea has been brewed, the person seeking to know his fortunes must drink from the cup. And when only a few drops remain, swirl the cup around three times. This is the step that allows the symbols to form. Reading of tea leaves is very much like tarot card reading in that it is not just about reading the future, but also providing insight into the present. The symbols that most often make their way into a reading are snakes, houses, mountains and spades. The tea leaves that appear towards the top of the cup signify good fortune, but as it approaches the bottom of the cup, the readings become graver. A tea reading session can take anywhere between 5 minutes to 15 minutes. The art of reading tea leaves is a science, some would argue, with textbooks and courses dedicated to it. The next time you sit down to drink a cup of tea, take a moment to appreciate that the ‘brown soggy stuff’ at the bottom of a teacup is what some people dedicate their whole lives to studying. For as long as humans look for supernatural means to make sense of day-to-day life, Tasseomancy will continue to exist.